In this post at Huffington Post, I argue that the question of whether Mormon leaders will offer an official apology for the pre-1978 policy of racial exclusion is about more than race. In a piece for Huffington Post, I begin a response to John Sweeney’s attempt to construct Mormons as a cult in a recent documentary. Today, the Huffington Post published my piece on the Mormon practice of baptism for the dead. 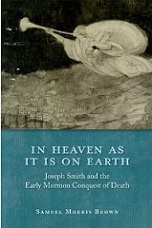 In Heaven tried not only to think through the big problem of explaining death but also to make sense of early Mormonism for outsiders. In this post on the Oxford UP blog, I contextualize two of the beliefs currently circulating in the media. Featured in the Wall Street Journal weekend books section, my column on the Five Best Books on Mormonism.